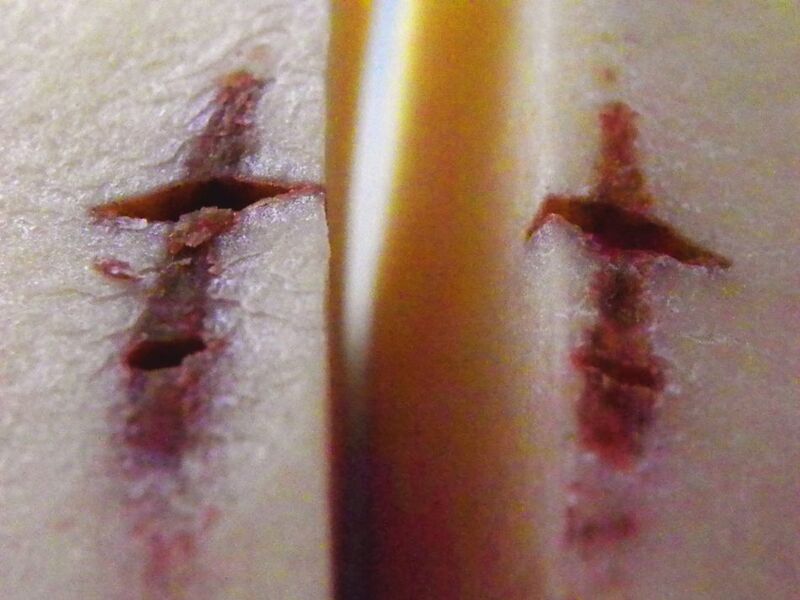 The Universal Story of the Holy Potato…. Here are two more photos now from America…. 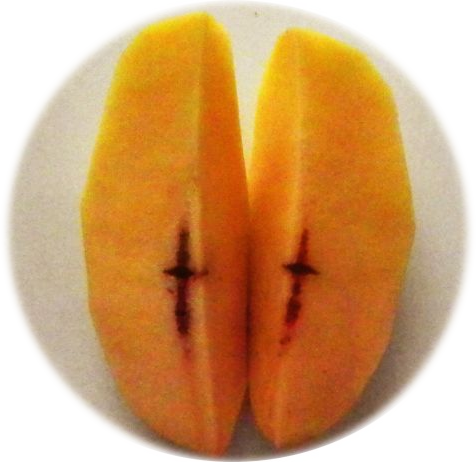 There are plants that over time have taken on profound ritual significance for humankind. The potato is one of them. Anthropologist Luis Millones, an expert on the beliefs and customs of Andean peoples, explores the world of magic and myth associated with this crop in the Andes. The potato plays a central role in the myths and rituals that define the Andean vision of the world. 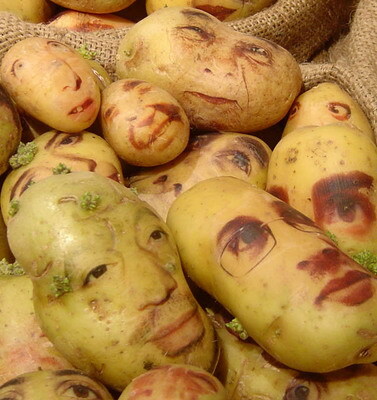 In their conception of the universe, potatoes inhabit the Uku Pacha, or inner world, a place of seeds and corpses, of future and past, as opposed to the Kay Pacha, or the world of the present. This idea dates back to before the time of the Incas, who adopted the beliefs of the people they conquered. Centuries before the rise of the Incas, the Moche culture (AD 100-600) flourished on Peru’s north coast. Moche pottery often portrayed fruits and vegetables. One outstanding example, on display in Lima’s National Museum of Archaeology, Anthropology and History, is a ceramic vessel resembling a potato. The link that the Moche saw between the potato and the supernatural world is evident in this piece in which figures of human beings and animals appear to sprout from the potato’s eyes. This Moche pot could be interpreted as a portrayal of the birth of living beings (the first humans, the first llamas, etc.) from the paqarinas (places of origin), where contact could be made with the Uku Pacha, the realm of the potato. In the most widely told myths of the origin of Tahuantinsuyo, as the Incas referred to their empire, the children of the sun god Inti, Manco Cápac and Mama Ocllo, emerged from the waters of Lake Titicaca. Another fable tells of the mythical Ayar brothers who sprang forth from the cave of Tampu Tuqu, near Cusco. 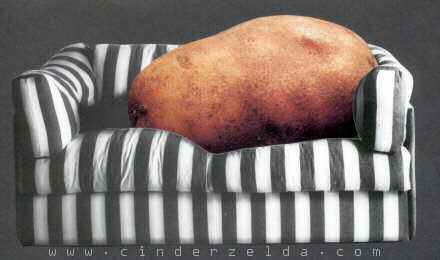 An interesting manifestation of the potato’s prominence in Andean myth and ritual is seen in the tradition of the illas, objects that evoke the primordial shapes of animals or plants. In Bolivia, researchers recorded that, “a potato illa [is] a stone that looks just like the potato itself, and it is thought that this illa helps the potato harvest” (Arnold and Yapita, 1996). According to the Aimara campesina Cipriana Apaza Mamani, when the condor, a sacred bird, flew down from Mount Illampu in Bolivia, the potato plant appeared for the first time in the community of Chukiñaspi. 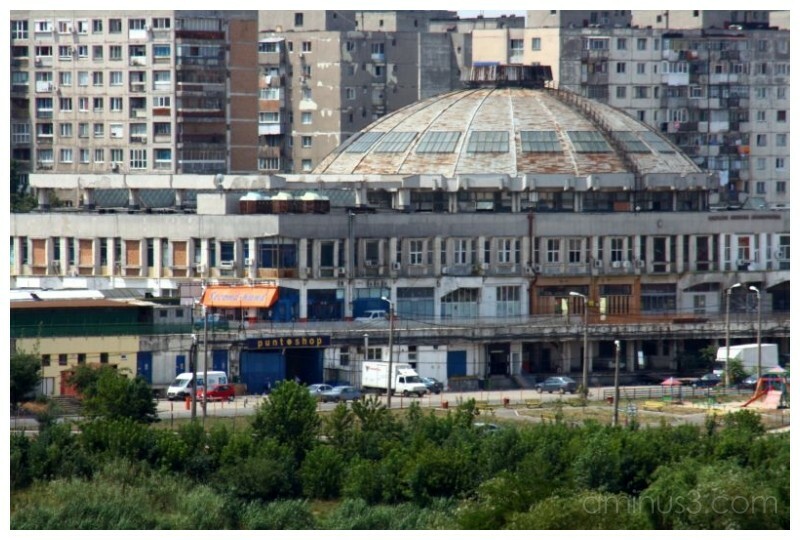 There, it flourished in a fertile area called Wilaspaya (the land of the red earth), known since time immemorial for its stones shaped like potatoes. In all ancient civilizations, people believed that they could control supernatural beings through the proper use of rituals. Ceremony is the food of the gods, and each part of a ceremony – a dance step, a coca leaf chewed or burnt as an offering – must be carried out according to age-old traditional prescriptions. 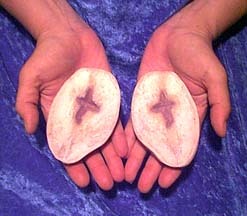 There are records of specific ritual practices for the potato. The chronicler Pérez Bocanegra (1631) records that the roots of the plant were tied together with straw, “with many knots and bundles.” This was done during fasting, and it is said that the potato effigy also fasted, thereby reinforcing the commitment to abstinence of the person complying with the magic ritual. This practice alarmed the Spanish clergy, determined to put an end to idolatry. The idea that penitence existed among non-Christian peoples raised the specter of demons, because the clergy believed that the Devil acted alongside all that was divine and mimicked God’s acts. Indeed, Pérez Bocanegra mentions the potato ritual in his thick tome dedicated to, “administering the natives of this kingdom.” Today, in Peru’s Ayacucho region, peasant farmers make simple offerings to the gods on All Souls’ Day (1 November). In a ceremony callxed aya uma tarpuy (sowing the head of the dead), a few coca leaves, llama fat and chicha are buried in the ground together with a seed potato in the hope that Pachamama, Mother Earth, will grant a bountiful harvest the following year. The name of the ceremony refers to the belief that the head can regenerate the body. In other parts of the Peruvian highlands, people celebrate potato rituals in different ways. Farmers, particularly in the northern highlands (Callejón de Huaylas and part of the Callejón de Conchucos, department of Ancash) sow their fields in late August, initiating the agricultural cycle. This is a critical time of year in ceremonial terms, because it coincides with the tilling of fallow land, which disturbs the domain of Pachamama and sparks conflicts with the Uku Pacha. During the Inca empire, unusual products of the harvest (such as twin potatoes or tubers that had grown together) were seen as good omens (Arriaga, 1968) and were regarded with reverence because people believed that they guaranteed the fertility of the fields. 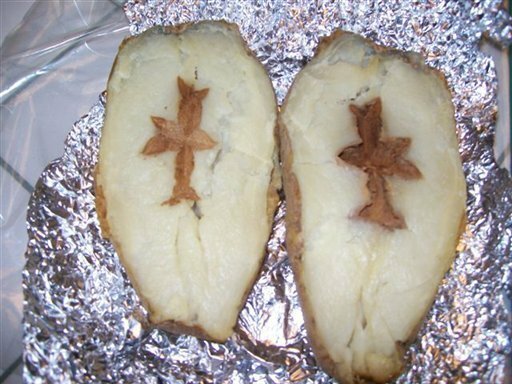 In colonial times, the Church fought in vain to stamp out the custom of keeping these potatoes. But this and other observances branded by the Spaniards as idolatry survived, and are still part of Peruvian folk religion. The finest observations of Andean idolatry are found in the Huarochirí tales, compiled by the priest Francisco de Ávila around 1600. Just as in the Popol Vuh of the Mayas (Recinos, 1963; Tedlock, 1966), these Huarochirí myths served as a sort of regional bible, assembling indigenous traditions that survived into colonial times (Salomon and Urioste, 1991). One long tale at the start of Chapter Five recounts the myth of the god Huatya Curi, whose story is intimately tied to the potato. The meaning of his name is explained in the first lines of the story: “They say that fellow named Huatya Curi subsisted at the time just by baking potatoes in earth pits, eating them the way a poor man does, and people named him the Baked Potato Gleaner,” (Salomon and Urioste, 1991). The tale is a vivid account of the clashes between this god (son of the powerful god Pariacaca) and his brother-in-law who, seeing Huatya Curi dressed in rags, was reluctant to admit him as a member of the family. Huatya Curi accepted several challenges proposed by his jealous rival. First, they competed at drinking and dancing; then with clothing and adornments; then at capturing and taming pumas; and finally, at building and roofing a house as fast as possible. Having triumphed in every contest, Huatya Curi – the potato eater – proposed the final challenge to his brother-in-law: to dance dressed in a blue kushma, or tunic, and a white huara, or loincloth. Huatya Curi waited for his rival to begin dancing. Then he entered the scene shouting, frightening his opponent and changing him into a deer. Analyzing the contest, one can see that Huatya Curi did not compete by showing himself to be a more skilled dancer, as might have been expected from a festive deity. Instead, he defeated his opponent using magic. Huatya Curi is the personification of the potato. His power is masked by his lowly appearance, as he is covered with dirt and dressed in rags. But beneath the surface, he is full of surprises. Likewise, the potato comes from the inner world, but it is not inferior. It is characterized by the duality of the gods: they are both brilliant and obscure, but above all, they are powerful. From the intimacy of the soil, the potato speaks to its children, who in turn trust in it to maintain the balance of the worlds that make up the Andean universe.